The reports say they had a big meteorite too but not as large as the one in Russia. It’s really not all that remarkable. Apparently this happened on Tuesday, and would probably have gone unreported if it hadn’t been for all the attention that the one over Russia attracted. There are several small meteors that burn up in the earth’s atmosphere every day, and generally go completely unnoticed, unless they are near a large center of population. As an example, several years ago, I saw a meteor burn up in the sky east of Calgary while I was on my way home from work one evening. I watched all the news reports on TV, and listened to the radio for several days afterward, but didn’t hear a thing about it. As I say, these things hardly ever get noticed, unless there is something to draw attention to them. [quote=@dax]The reports say they had a big meteorite too but not as large as the one in Russia. "Have traveled to:North America;all 4 countries including all 50 US states"
Hey Dave … What is your definition of North America? I’m not sure what Dave is including, but there are the three obvious ones, Canada, USA, Mexico. The fourth one could be St Pierre & Miquelon? Or maybe Greenland? 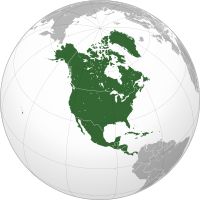 Actually, North America technically includes Central America, and the Caribbean, so it consists of 23 independent nations, plus a number of dependencies and provinces or departments of various European nations. Since this is turning into a pi**ing match, the only way I can have a chance of winning if I count the number of countries that I haven’t been to that I WANT to go to. No offense dax, but Machu Picchu is in Peru. Wish you’d change your mind! We visited Machu Picchu in 1983 and it was spectacular. I’d love to go again or certainly before the place is totally ruined by too much tourism or a meteorite. [quote=@radar]"Have traveled to:North America;all 4 countries including all 50 US states"
Obviously Greenland, Canada, United States of America & Mexico. Didn’t realize Bermuda was not considered of the Caribbean & the French owned islands are insignificant. I did list CA & the Caribbean separately. Argentina … I bet meteorites have been there. And Bermuda is far from the Caribbean, as is Varadero, CSM, Cayo Coco and Holguin. The Caribbean does enter the Gulf of Mexico, mixes with the oil spills and fertilizer-dead zones before being pushed past the Florida Keys towards Atlantic Canada and on to England. There have been lots of meteors in the Gulf. Anybody remember the Dinosaur family that lived down the street?